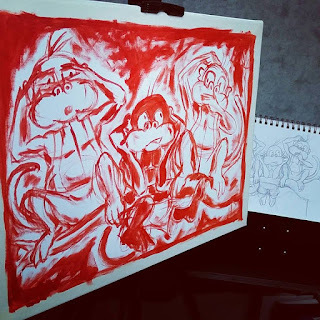 Last post I announced the start of a new painting titled, Three Wise Color Monkeys. Turns out I was serious about getting back into creating some traditional art because I managed to get over the first hurdle... making a start. For most artists, making a start means setting up the canvas, paints, and actually painting the first brush strokes. For me it's working out how I'm going to set up my camera so I can film the whole process with the least disruption to actually doing the art. You'd think I'd know where to set up a camera by now considering I have filmed myself painting more than 30 artworks on my YouTube Channel. The problem was, if I set my camera up in the usual way, it would constantly be in the way of a major thoroughfare through my studio. With a bit of thought I managed to find this amazing elevated camera angle just over my right shoulder (see the photo above), achieved by standing my tripod on top of a bookshelf. Not only is the camera nicely out of the way but also, the view is wide enough that I can talk to camera if need be without bending too much to make sure my head is in shot. You might think setting up a camera is not much of a barrier to making a start, and you'd be right. However I'm not actually a big fan of filming myself painting so setting up a camera is more of a chore than it really should be. Plus I can't really not set up a camera when I'm trying to revive my YouTube channel. 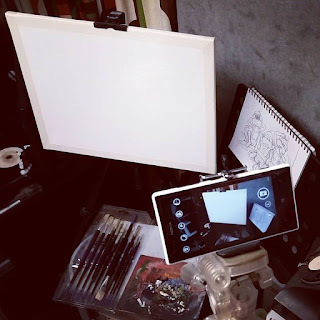 Watch the video diary below for a little more info about my camera set up then watch me paint stage 1 of the actual artwork. Transferring the Sketch to Canvas. 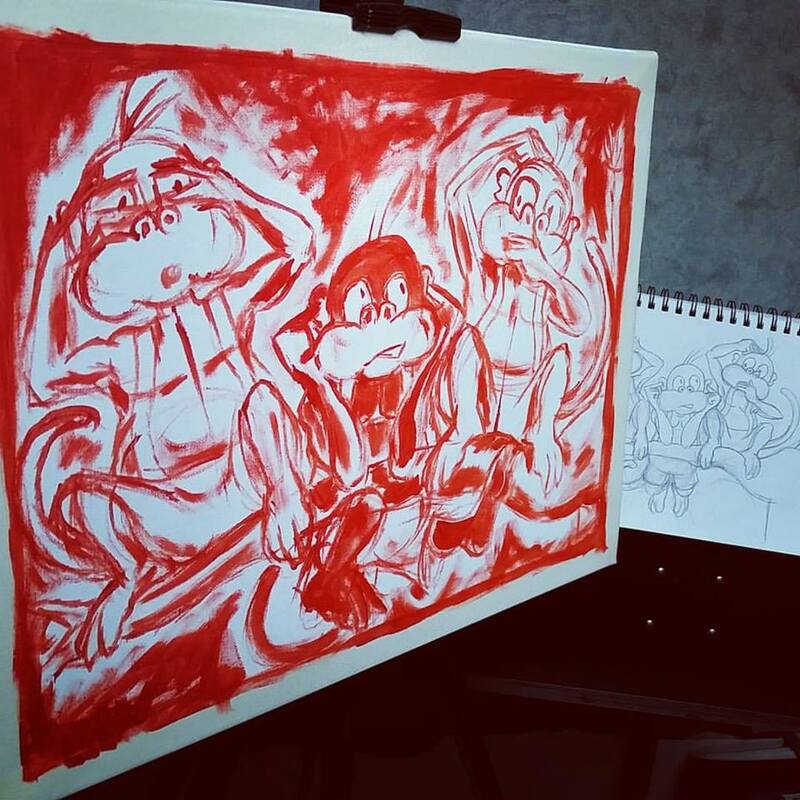 Almost every painting I've done since 1995 starts the same way, drawing the sketch onto the canvas using red acrylic paint. There's no light pencil sketch first - though I seem to recall I used to do this but at some point I decided it was a waste of time. The way I paint is very loose in the beginning, gradually progressing to finer, more considered detail toward the end. As a result any initial drawing tends to get lost under my paint so I just stopped doing them. For those InkTober purists who think drawing digitally is easy because you don't have to commit to your lines, try drawing in red acrylic paint on canvas, and then talk to me about 'commitment to lines'. As you can see from the photo above my transfer sketch is very loose, possibly even unintelligible in places to anyone but me. You'll also notice I've filled in areas with red because red paint also serves as a mid-tone for my initial under painting that I do using the three primary colors (red, yellow, and blue - did I really need to spell that out?). If you're really observant, and able to decipher my scribble, you may notice the middle monkey's legs have changed position. I wasn't happy with the way they were positioned in the sketch so I thought I'd try something else (how's that for commitment - InkTober purists?). The next stage will be to complete my under painting, then to start blocking in the major areas of color. I'm anticipating this to be a some what easier painting to complete given the majority of the final color is very close to primary and secondary colors (the colors you get from mixing two primary colors together - helped spelling that out, right?). Hopefully I'll get most of that done by next week. If you'd like to follow this artwork's progress but blog posts and video diaries aren't for you, I'm also posting work in progress photos to my Instagram. So be sure to stop by there and follow me for the latest images.